With a little creativity and a few basic pieces of equipment, you can start a fitness program at home. The convenience of exercising at home allows you the opportunity to workout when and how you want to. And, it saves time and money too! No need for a gym membership or making time to travel to the fitness club early in the morning to get a quick workout in. Especially for beginners, health clubs can be an intimidating experience. The exercise equipment alone can be difficult to master. Unless the personnel at the club are handy to instruct you on proper use, these machines can be a detriment instead of a help. In these financial times, a fitness club membership can be expensive. All you need is a little space (about 5 square feet) and a few simple pieces of equipment and you're ready to roll. Of course, if space is available and money is no object, then a sophisticated home fitness center is fabulous but, if you're like me, someone with limited resources and very little room, this is all you need. Use any combination of weights that your comfortable with. That’s it! How simple can that be? Going online and doing a little research, you have a virtual personal trainer at your finger tips. Websites like the ones below, provide expert instruction along with videos or illustrations so you can tailor a workout plan to suit your needs. They also have articles on health and nutrition that are valuable tools if your trying to live a healthier life. In this fast paced, stress filled world, living a healthy lifestyle is a huge advantage. No matter the situation, scheduling thirty minutes 3-4 days a week can lead to a leaner physique, stronger muscles, and just better self esteem. And the key is, your doing this right at home. I know finding the motivation to workout at home can be difficult but, if you think of all the benefits gained by a fitness program and all the money you saved can be motivation itself. Let me give you some insight on the Swiss Ball. Most fitness experts agree that along with good cardiovascular health, muscle strength and bone density are essential to maintain a healthy and long life. And, core strength is a major contributor. Your core, which most people misunderstand, is not just your abdominal muscles but , also include your lower back and upper leg muscles (thighs). They provide stability and strength which are keys to overall quality of life as anyone with lower back problems can attest to. The Swiss is a multi-purpose piece of equipment that if used properly, can greatly increase core strength. I use it as substitute for a weight bench during a dumbbell workout. 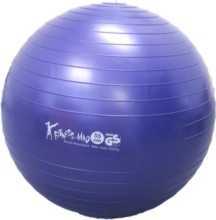 The ball engages the core muscles when doing bench presses, overhead presses and flies. Trying to keep the ball stable while working out really hits muscle groups that aren't used on a normal weigh bench. Swiss ball crutches allow for greater range of motion which increases ab strength and tone. About Exercise has a fabulous series of articles that fully explain its' various uses and benefits. In conclusion, my main point is the importance of getting regular exercise in our routines. With the rise of obesity, heart disease and other major health problems in America a fitness program is necessary and vital to longevity and quality of life. GET UP AMERICA AND MOVE! Would you rather workout at the gym or in your home? The perfect workout isn't about perfection. It's efficient, effective and easy to do anytime. No gym or equipment necessary. Nate, you're right about convenience and staying with an exercise routine, they go hand in hand. I love having the option of working out at home, because of unusual circumstances. It eliminates the excuse of missing a workout. Thanks for your kind words... Ciao!!! Great Hub, Jai. I'm a huge proponent of home-based programs as I find that folks are much more likely to stick to a program that's convenient and it doesn't get any more convenient than home. Good stuff...thanks. Very good and pratical plan for starting a home fitness routine. I love the weights and the stability ball, I use them both and they are very easy to work into your schedule at home PLUS it makes a huge difference. It feels good to be tight and have strong muscles minus any soft flab. I do go to the fitness center occasionally, but having weights and a Swiss ball at home is great! And, you can really get a fabulous workout... Thanks for commenting, Ciao!!! I guess if having a cup of tea, watching a fitness video gets your heart rate up, you could consider it a workout. lol! Seriously, the Swiss ball is really a great piece of equipment for the home. It's not only challenging, but fun too. Thanks, Elena. Ciao! Great Idea. Saves one the bother of going to the gym. I will consider it. My idea of fitness is to watch a fitness video while having a cup of tea. (not even taking part) So lazy. lol. The Swiss ball appeals to me. Thanks for the info explaining its uses. That's very true, and if you keep them where you see them all the time, you'll tend to put them to use. Thanks for that insightful comment. Ciao! 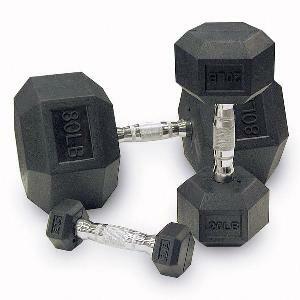 I have those really lovely-to-hold dumbells that are covered in some kind of a soft plastic material. I have a bright green and a bright orange set so whenever I walk past them and I'm in the mood I'll do some exercises with them- not a full workout, mostly just dancing to wake my body up. I work from home so I need to shake myself up every so often. Anyway if you have nice equipment then it makes you want to use it more, plus you don't feel bad about leaving it out. That's a great point about keeping the weights where you trip over them. I stare at my Swiss ball and dumbbells when I'm watching TV or on the laptop. I'm fortunate enough to have a great fitness center at the apartment community where I live. So, I have a lot of alternatives. Thanks for the visit! Now, get off that couch and give me 25 push-ups! jai-im all for the work out at home. . and i try to at least get a few minutes in the morning. . i long for the warm weather so i can get outside for my power walk. . its so hard to motivate in the winter. . so i keep my set of weights in a spot where i will trip over them. . ha ha it works. . im better at it at home then getting to a gym anyway!!! I must say I find that it is hard to discipline myself to exercise at home. I have various bits of equipment that gather dust! I find that by pre-paying for pilates classes I will always go. I know it would be nice not to pay but that's just me. Lazy I guess. It is hard to for me to stay motivated working out at home.